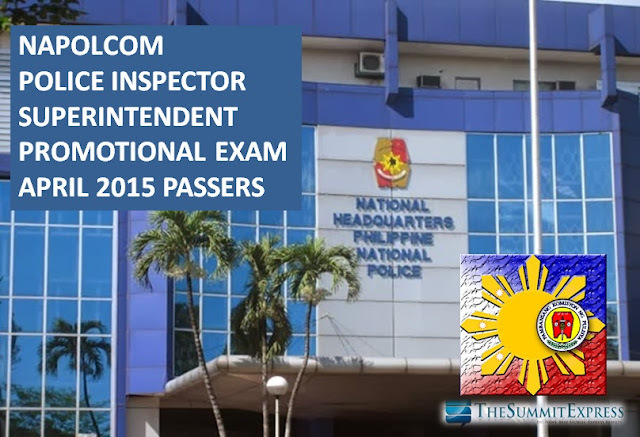 MANILA, Philippines - A total of 329 examinees passed the Police Inspector and 224 successfully hurdled the Superintendent promotional examinations conducted by the National Police Commission (NAPOLCOM) in April 2015 in various testing locations nationwide. NAPOLCOM administered the PNP entrance and promotional examinations on Sunday, April 26, 2015 to a total of 35,674 examinees. The results to include the list of passers and topnothers (top 20) for PNP Entrance, Senior Police Officer and Police Officer were already released on Tuesday.